THE ROMANY LIFE: We Got Blown Up! Storm Watching On The Pacific Coast! We Got Blown Up! 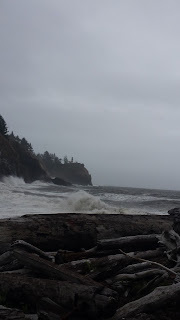 Storm Watching On The Pacific Coast! If you really want to make me happy, plant me on a stormy coastline just ahead of a whopper of a storm! I have no idea why, but being in the midst of storms really is my happy place. It doesn't make sense, because I am such a chicken heart in so many ways, I am the one saying, "Be careful!" "Drive Safe!" "Don't run with scissors!" ...and I really do mean it. I am Chicken Little reincarnated, but boy do I love me some stormy weather, the more violent the better! 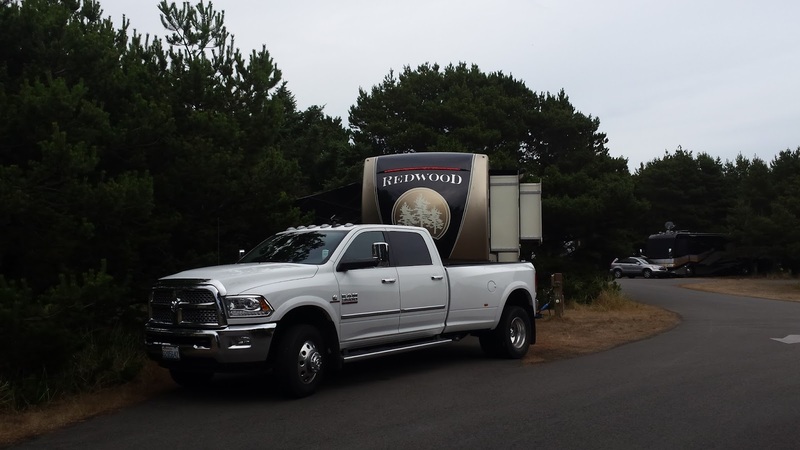 Recently, we took our big girl (our 42 foot Redwood fifth wheel) to the coast for a short little vacation getaway. We hadn't really looked much at the weather, and didn't much care, it was just nice to get away. Our trailer is extremely comfortable in any weather so it truly is not a deal breaker if it is going to turn nasty outside. 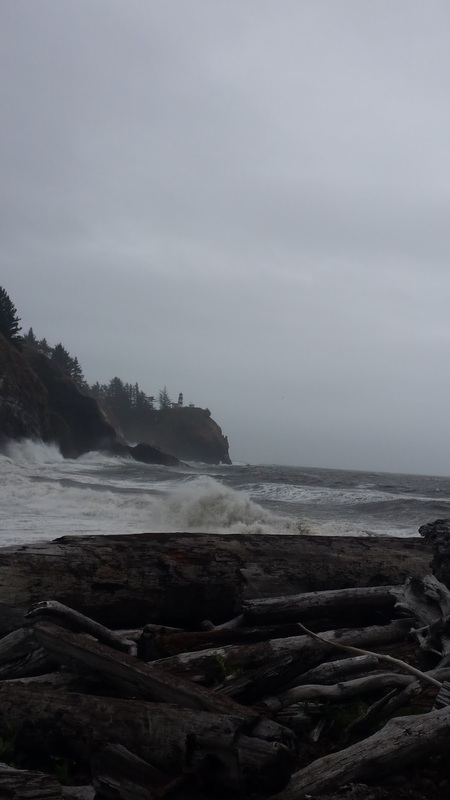 We scored a reservation at Cape Disappointment State Park and as we pulled in, I pulled up my trusty weather app on my smartphone and to my complete and utter delight, saw the RED EXCLAMATION POINT and a weather ALERT! My heart skipped a beat and I opened the warning message like a gift under the Christmas tree. Dare I hope...? WIND! Not just a breeze, not just a little gusty, but honest-to-goodness gale force winds were headed our way! Hurray! And to add to the wonderful news, the loop that we were in was full of shore pines as opposed to large fir trees and nearly right on the beach, JOY! That meant there was no reason for any fear, because shore pines are short and shrubby and very flexible, they rarely are affected by wind. I am terrified of wind when I am surrounded by big trees, as I am in the park where we live (that's ANOTHER post!). I am NOT happy about a wind storm in there. We had just enough time to have a nice dinner after getting parked and set up and to have at least most of a nights' sleep before the storm would hit. We filled the freshwater tank and went to bed. And what to my wondering ears did I hear (in the wee hours of the morning?) The howling, moaning, unmistakable sound that a storm makes at the beach when it's rolling in. If you have never heard it, you have to visualize the sound you hear in Halloween sound tracks... I can see why sailors wrote songs about the sound it makes, very ominous and frightening. I was ECSTATIC, I almost couldn't sleep any more! Sure enough the gale came rolling in, along with huge surf and pounding fits of sideways rain. The power went out before late morning and, for us RVers (with a 5000 watt generator) that is no big deal at all! The wind was causing our slide awnings to billow and flap violently so we pulled our slides in to protect them and put on our hiking gear. I was disappointed that we didn't have our "storm stuff" with us: Ski goggles, ear protection, water proof gear. Darn! At the coast when the wind blows and you go out in it, the sand is being hurled at you with such force, it is impossible to open your eyes, and your ears become very agitated with the constant raging wind. It is similar to being sand blasted, if a person decided to do such a thing. By the time you get back to the RV you will have sand everywhere, on your scalp, in your ears, between your fingers, in your teeth! We headed up to the lighthouse where we knew it would be at it's worst. WOW! It was the strongest wind I have ever personally experienced! Twice I was blown off my feet and always had to hang on to something. It must be what a hurricane feels like! I never learned what the wind speed ended up topping out at, but I know they were forecasting more than 70 MPH gusts. I expect that it's a little higher when you are standing way out on the end of the bluff at the foot of a lighthouse! So, if you are headed to the coast and a storm is coming, try to look at the bright side: There is at least ONE person who envies your luck and don't forget your ski goggles! It's a BLAST! Simple Life, Simple Meals, Simply Wonderful!